Opal is a Saiyan with long, black, well kept hair. She also has blue eyes like her mother and sister. Opal is your classic derpy, clumsy, hot mess individual. She is almost always tripping over things, or just the air. She’s fun to be around and is a lot less serious than her older sister Scarlet. She can be smart when she needs to be but prefers to just have fun and let fate take the wheel. Opal likes to let loose and have fun and she doesn't like to be told "no". 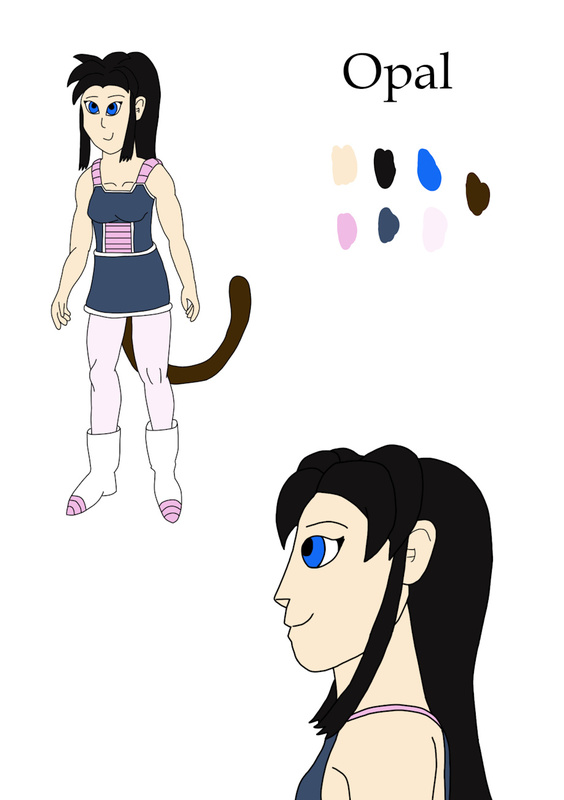 Opal grew up with her sister and parents on the second “Planet Vegeta”. Like her sister she was sheltered by her father and wasn’t allowed to fight or date, which made them want to do it even more. Her and her sister would often sneak out in the middle of the night and train without her parents knowing. Opal adores her older sister but wishes she would loosen up a bit and have more fun with life. Although she was completely ignorant to most things that didn’t stop her from trying or learning them, which would often lead to big sister bailing her out of trouble. The day that Scarlet was to be living and working in Conton City Opal was stricken with sadness and jealously. She too wanted to explore the world and try new things, but that fate was Scarlet’s. Now she waits for the day she can see her sister again and talk about all her adventures. Opal wears typical female Saiyan attire. She doesn't do a lot of fighting so she doesn't tend to wear too much battle amour. Yay, another character off the list! Only about 500 more to go lol. So this Opal is loosely based off my bestie Dunkin's Opal. Ok, so for those who don't know I have 2 Night Elf druids Waffle and Scarlet. She made a Night Elf druid named Opal and we decided that Scarlet and Opal should be sisters. So when I made my Xenoverse characters that are based off my World of Warcraft characters I figured I needed to make Opal as well. Phew.